The residents of Airlie Street South Yarra wouldn’t be surprised to hear that their new Postie was confused about the numbers on their street; it’s an oddity which is frequently remarked on by the residents. ìBut why are the numbers on Airlie Street so odd?î I hear you say… we’ll get to that but first a little history. In 1835, the year after Melbourne’s first settlement, the land between Anderson Street and Punt Road was part of the 835 acre Aboriginal settlement under the direction of George Langhorne, a nephew of Captain Lonsdale. The mission was not a success and seems to have become abandoned by 1840. Parts of it became available as a reserve for the future Botanic Gardens, created in 1846 and other parts for sale to private buyers. 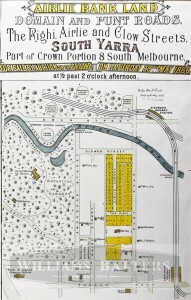 On 21st May 1846, under an old system of titles known as General Law System, a Crown grant for Crown Portion 8, Parish of South Melbourne was issued to a David Ogilivy. The grant covered about ten acres of land from Clowes Street to Domain Road having a frontage of five chains to both streets and twenty chains frontage to Punt Road. The price paid for the land was one hundred and forty pounds. The new owner built a brick and stone house of six rooms and a kitchen, with a stable, gig house and a shed as outbuildings on the site of the present Witchwood Close and in 1847/8 the property, called ìAirlie Bankî was rated by the Melbourne City Council at eighty pounds per annum. A portion of land or about six acres between what is now The Righi and Clowes Street was laid out as a vineyard from rooted cuttings. A red hermitage wine was sold through auctioneer, W.M Tennant of Melbourne. When Davis Ogilvy died in 1871 aged 67, the land passed to his widow Elizabeth. She sold it in 1885 to David Whitely with the exception of two blocks, one on the corner of Domain and Punt Roads and the other containing the original house. Both sold separately. With a new, more modern title the land was subdivided into smaller lots and sold on the 29th May 1886 Airlie Street and The Righi as new streets. Building development on Airlie Street was fairly slow. By 1893 only ten houses had been built on the thirty lots available and it was to take another forty years before the street was fully built up. This infilling over a comparatively long period was the reason for the varying styles of architecture and the strange sequences of numbers on both sides of the street. The street has escaped the excessive disruption of modern flat development and some of the earlier improved houses are being restored to their original outward appearance as the owners become aware of the financial as well as the aesthetic advantages of a late Victorian style in a well situated street in one of the more pleasant of Melbourne’s inner city suburbs.